Across the country, parents are gearing up to celebrate Halloween with their kids, and that includes plenty of sweet treats. But sometimes, candy can look a lot like medications and vitamins, especially to a curious child. Any medication or vitamin that is taken the wrong way, or by the wrong person, can be dangerous. Every year, almost 60,000 young children accidentally ingest medications and end up in the emergency room, according to the Centers for Disease Control and Prevention. Luckily, most visits result in the child being able to be discharged home after monitoring. But occasionally, children may need to be admitted to the hospital for treatment. These types of health scares can be prevented by keeping medications away from children in the first place. This Halloween, the CDC is reminding parents to keep medications locked up safely and out of reach of children as part of its “Up and Away” campaign, which partners with other government agencies, safety councils and medical groups. Here are their six tips to help keep your kids safe this Halloween and every other day of the year. 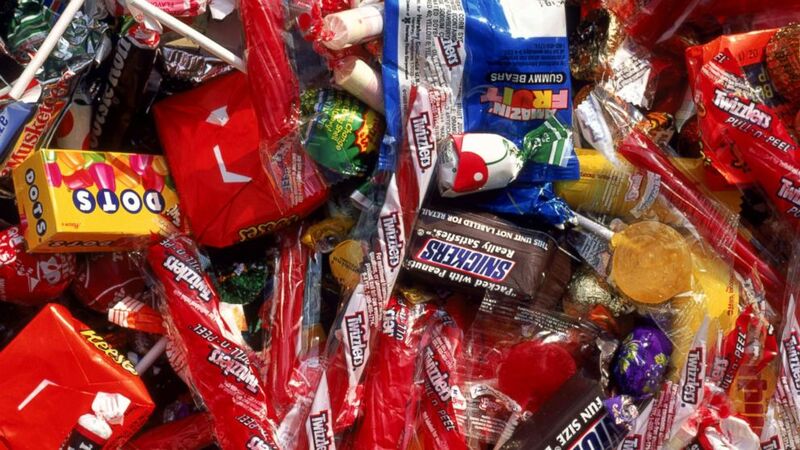 A variety of candy is seen in this stock photo. Medications are often left on the kitchen or bathroom countertop to help remind us to take them every day, but those places are often within reach of our children as well. Take a quick walk around your house and take stock of where you’re storing your medications. Make sure it is well above the reach of your children, up and out of sight. Never leave open medications out within reach, even if you’re just stepping away for a minute or plan to give another dose again in a few hours. After you take the medication, remember to put it back in a safe place. This includes medications and vitamins you take every day. A lot of bottles have child safety caps, but they don’t work if we don’t check them. Always relock the safety cap after each use, and twist them to make sure they’re on securely. Prevention starts with education. It’s important to teach children what medicine is, and make sure they know that only their parents or caregivers should give it to them. Never tell a child that medication is candy, even if they don’t like taking it. Variety of pills and capsules are seen in this stock photo. Remind guests who visit to keep medications in their bags, coats, or pockets out of sight and out of reach. If possible, have them take their medication at home, or offer to store them in a safe place in your home. Save the American Association of Poison Control Centers’ number in your phone in case of emergency: 1-800-222-1222. Call Poison Control right away if you suspect your child has accidentally ingested a medication or vitamin, even if you’re not completely sure. Post the number on your refrigerator or in another prominent place in your home, and make sure all other caretakers — grandparents, babysitters, and nannies — have the phone number on hand as well. Dr. Tiffany Yeh is an endocrinology fellow at New York-Presbyterian Weill Cornell Medical Center and a member of the ABC News Medical Unit.